Last week I finally got to get away on vacation for a week. While away, I managed to paint a couple boomerangs in a dot art style. 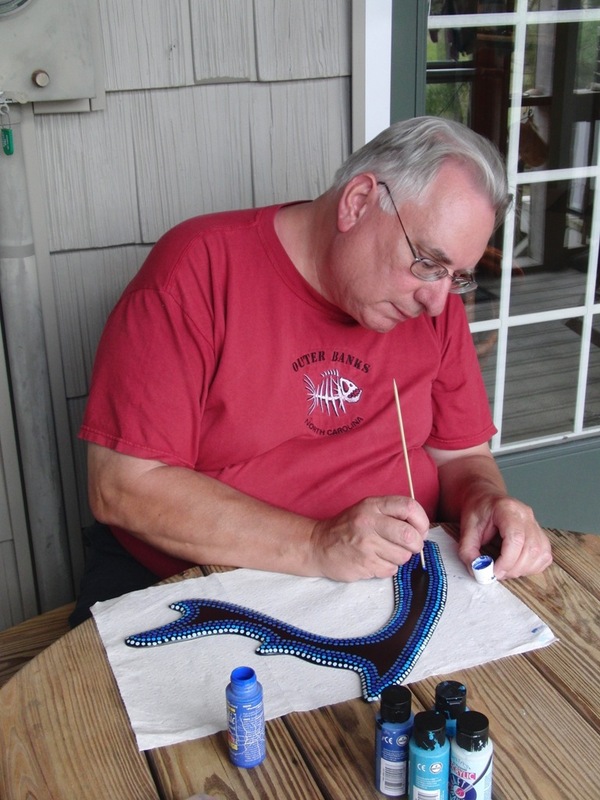 Here is a photo of me painting one of the shark boomerangs I had with me. Those of you who read this blog already know about the exploratory class I teach here at work for students at a local inner city school. This is part of an initiative by my employer to help these students be better and includes an email buddy program, a remedial reading program and the exploratory classes which are done based on the employee’s hobbies and interests. I have been in the program for 10 years and have done all the programs with the latest being my “Australia, the Dreamtime and Boomerangs” class. Yesterday my employer had a lunch thanking all the volunteers for their work with the students over the past year. We have this every year and usually we get a little gift. This year it was a insulated lunch bag with the company logo on it, last year a flash drive. After the lunch we all get paraded into the big conference room in front of the managers of the company. They applaud for us and two Community Service Awards are given out to people in the program. I have often wondered how someone gets selected and what is needed to win an award. The award is a glass eagle on a base with a name plate. This year the first award went to a woman here who teaches various exploratory classes. She has done art classes and cooking classes. I think she is working on a gardening class for this year. The president of the company picks up the second award and announces “Could Dave Hendricks come forward?”. I think my eyes got as big as dinner plates and my jaw hit the floor. I was very shocked to hear my name called out. He went on to tell the group that I had been in the program a long time and had done email buddies, reading program and my Australia and boomerangs class. He mentioned me bringing boomerangs to the spring picnic and teaching the students how they work. Meanwhile I stood there still trying to believe it was happening. He shook my hand, handed me my eagle award and everyone applauded. It was quite a lunch for me.